IndustrySafe, a leader in safety management software, is pleased to announce the release of its initial incidents form to the IndustrySafe mobile app. This app, first launched in December of 2017, now allows workers to record workplace incidents from their mobile devices, with or without internet access. “At IndustrySafe, we understand that each company’s safety challenges are unique,” states Gabe Tompkins, IndustrySafe’s Vice President of Technology. “With this in mind, we developed this update to allow system administrators to configure which modules are available to users, so that frontline employees can record either incidents, inspections, or both, depending upon the needs of their company. Users with access to record both incidents and inspections will also be able to seamlessly toggle between the two modules as often as they need to,” he adds. Initial Incident forms can be submitted to the IndustrySafe software for detailed analysis and investigation by key team members as soon as web access is available. Safety professionals can then complete additional incident forms and generate regulatory reports, including OSHA recordkeeping logs and DOT accident registers. With the data provided by the IndustrySafe mobile app, companies can compare safety and health indicators across modules, calculate incident rates, view inspection completion rates and more. 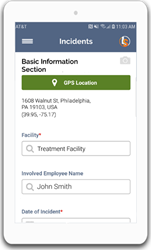 “Without the use of mobile technology, workers in the field can spend a considerable amount of time collecting incident and inspection data, and then sometimes must work to file or re-enter this information into disparate databases,” explains Clare Epstein, IndustrySafe’s Chief Operating Officer. “Our goal for this update was simple. We wanted to enable organizations to efficiently record incidents and inspections on the go without burdening employees with multiple tools or applications,” she adds. The mobile app and its new incident recording feature is available at no additional cost to subscribers of IndustrySafe’s Incidents or Inspections modules. Customers may download the app from the App Store® and Google Play™ for iPhone and Android devices. Additional information about the features of IndustrySafe safety management software and its mobile app is available by signing up for one of our free webinars, or by contacting us at sales@industrysafe.com. IndustrySafe is a web-based safety management software developed so that organizations can track incidents, OSHA reporting, inspections, corrective actions, training, claims, hazards, behavioral based safety, and more. IndustrySafe’s Incidents module and mobile platform assist organizations in achieving OSHA compliance by streamlining the incident reporting process and compiling all incident data for in-depth analysis. IndustrySafe clients include leaders in manufacturing, construction, government, and transportation. iPhone and App Store are trademarks of Apple Inc., registered in the U.S. and other countries. Android and Google Play are trademarks of Google Inc.